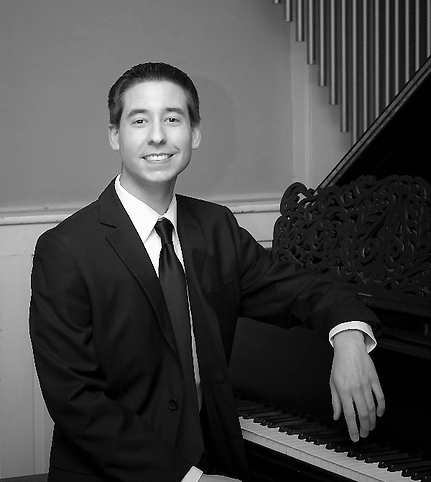 Jake Troy is an active pianist, organist and choral conductor based in Connecticut. He has accompanied numerous choral and instrumental ensembles, soloists, festivals, workshops, and musicals. Jake has performed in chamber music settings throughout the area, and is on staff as Choral Accompanist for Old Saybrook Public Schools. Jake is currently Organist and Choral Accompanist at The United Methodist Church of Gales Ferry, playing for religious services and accompanying multiple choirs under the direction of Joy Lamb. Previously, Jake served as Organist and Director of Music at The First Congregational "Road" Church in Stonington, Connecticut where he directed the choral ensemble and played services for over six years. He holds membership with the American Choral Directors Association and the American Guild of Organists, and was invited to participate with CONCORA during their 2014 Summer Festival as both a baritone and pianist. Most recently, Jake was the guest conductor for the 2017 New London County AGO Children’s Choir Festival, and he will be joining Connecticut College as Choral Accompanist beginning in the fall. A seasoned accompanist, Jake began playing for choirs at an early age while studying piano under Royden Wilkinson, and has played a number of weddings, funerals and other religious ceremonies across the region. In addition to his piano and organ work, Jake has taught music and directed numerous choirs at various levels in the public school setting, and regularly serves as accompanist for multiple public and private schools throughout the area. Jake holds a Bachelor of Science degree in Music Education from Central Connecticut State University where he studied piano under Dr. Linda Laurent, choral music and conducting under Dr. Pamela Perry, and music education under Dr. N Carlotta Parr. During his tenure at CCSU, Jake was a member of the highly acclaimed CCSU University Singers, and performed with the group as a baritone during a concert tour of Spain in 2011.